It may come as a surprise, here in Surprise, that Easter did not end this year on Sunday, April 1st. “No,” this isn’t an ‘April Fools’ joke! By the fourth century, the early Church started observing Easter, not as a solitary day, but as a season of renewal. One which does not officially end until Pentecost Sunday. In the Greek, Pentecost means ‘fifty.’ It represents the number of days from our Lord’s glorious resurrection to the unleashing of the Holy Spirit. In the Jewish calendar this became the third most important religious holiday called the “Feast of Shavuot” (i.e., the “Feast of Weeks,” or “Feast of Firstfruits”) which comes fifty days after the Jewish Passover. For Christians around the world, Pentecost commemorates the coming of the Holy Spirit. It is one of the most pivotal events in all of redemptive history. A time when the Holy Spirit revealed Himself in dramatic ways. Just as it was foretold in prophecy by the nineth century prophet, Joel, who spoke of a day when God promised to: “… pour out His Spirit on all mankind; and your sons and daughters will prophesy, your old men will dream dreams, your young men will see visions…and He will pour out His Spirit in those days” [Joel 2:28, 29]. By all acounts this was a ‘Kodak moment’! A one-time event when the Holy Spirit unveiled His Person in unimaginable ways. A time when the Holy Spirit came to mankind: MYSTERIOUSLY, MIRACULOUSLY and MAGNANIMOUSLY (repeat). In Old Testament times the Holy Spirit was likened to that of: ‘flames of fire’ or a ‘mighty rushing wind’. But a new era was about to unfold after Christ had ascended to heaven, and to this day, sits at the right hand of God the Father Almighty. But, at first Christian Pentecost, the Spirit of God was seen in an entirely new light. Like that of a dove descending from heaven. Just as He did on the day when Jesus was baptized in the River Jordan, which served as His commencement for His ministry here on earth [John 1:29-34]. It was on that day when the eleven disciples, along with one hundred and twenty of Jesus’ followers, gathered to pray. Suddenly, quite mysteriously, they heard what sounded like “a violent wind” which filled the room. 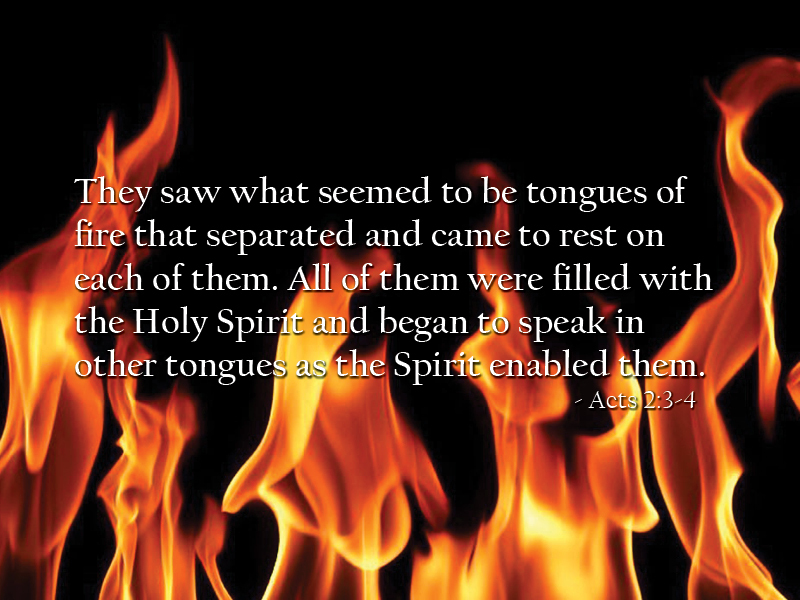 Whereupon they saw what appeared to be “tongues of fire” which rested upon each person there. They heard with their ears, and they saw with their eyes the Person of the Holy Spirit! And the Spirit still remains MYSTERIOUS in all His ways. Mysterious insofar as He never draws attention to Himself. Rather, He bears witness as to the Person of Christ Jesus and of His redemptive work. Jesus explained this mysterious divine entity to the Pharisee, Nicodemus, where He said: “The wind blows where ever it pleases. You hear the sound of it, but you cannot tell where it comes from or where it is going…” [John 3:6]. The Holy Spirit is mysterious because His origin is from of old; before time began. They spoke in ‘other tongues’. That is to say, they were discernible and understandable languages. The words they spoke were not jibberish! These were audible and recognizable languages previously unknown to them. Today, there are resources available which assist us in learning foreign languages in a short amount of time. However, on this occasion they spoke in foreign dialects instantaneously! It has been my experience that after studying Hebrew for two years, and Koine Greek for three years, I still rely on bi-lingual concordances! Do you get my drift? Jesus’ disciples were already saved before the day of Pentecost. At the ‘Last Supper’ while they were huddled in the Upper Room, Jesus said to them: “You are all clean!” In other words, they were saved. They were His! And this same progression occurs when we become followers of Christ. First, we are indwelt. Next, the Spirit empowers us, He equips us to serve Christ in a variety of ways. Which brings us to another important function of the Holy Spirit, for it is the Spirit who bestows spiritual gifts. Every believer is given at least one gift [e.g., Romans 12, 1 Corinthians 12, Ephesians 4 and Hebrews 2]. It’s my belief that all believers have one gift in common; that of spiritual discernment. Another aspect so evident on Pentecost was how: MAGNAMOUSLY God works through His Spirit. People from all parts of the then known world heard the gospel preached in their own language. Peter, and the other apostles, spoke boldly and with such clarity of thought which provoked them to accept Christ as their Lord and Savior. When asked what they must do, Peter told them in no uncertain terms: “You must repent of your sins and be baptized in the name of Jesus Christ for the forgiveness of your sins and you shall receive the gift of the Holy Spirit” [Acts 2:38]. And we’re told that there were some three thousand souls saved that day. Luke tells us that throngs of people were “amazed”, “bewildered”, and “perplexed”! Turning to one another they asked, “Aren’t all these who are speaking Galileans? Then how is it that each of us hears them in our native language?” Which verifies this basic precept where it says: “Whom God calls; He equips.” But there is a common language which all people everywhere can respond to and understand. It is best described as: “the language of the heart”! Supposedly, linguists can not only detect where you are from, but can pinpoint the precise the region, or district. For example, one of my golfing buddies is from New Jersey (New Jur-zay). His dialect is easily recognizable! And, of course, who could ever forget Jim and Nan Fraser’s accent. Their Scottish brogue would have you believe they had just arrived here in America! As for me, I have what’s called, ‘a lazy Missouri (pronounced Mah-zur-rah) tongue’. So, just imagine how astonished these people were when Peter spoke to them so articulately in their own native language! Put simply, the Holy Spirit did not empower the Church so that it would conform to the ways of the world. Quite the opposite! The Spirit came to transform the world by way of the Church! Yet, on this auspicious occasion there were cynics. In verse 13, Luke writes: “Some, however, made fun of them suggesting, ‘They had too much wine to drink.’” There were cynics then, just as there are now. People can either choose to believe or not to believe. Others may remain skeptical. Some, however, prefer to be openly defiant of, or abusive towards Christians. And many of us are miffed by their callous insinuations. But remember this. They are not hurling insults at us…personally. Perhaps unknowningly, they are doing something far graver. They are excoriating the Lord Christ! Worse yet, they may find themselves blaspheming the Holy Spirit, which is the one unforgivable sin that can never be expunged! So, the only question remaining is simply this: “Have you been ‘born again’? A cliché which so often has been misinterpreted, or misappropriated. I prefer a lesser known Quaker expression from a bygone era, which asks: “Have you been quickened?” Well, have you? Let’s be clear. You will either be quickened, or you could find yourself sinking in quicksand!